McDonalds began to mature as a successful global business toward the beginning of the 70’s. By 1970, there was at least one McDonald’s restaurant in every U.S. state, and several in different countries around the world . In 1987, the United Nations World Commission on Environment and Development, which had convened to address the global ecological crisis, produced Our Common Future (the Brundtland Report). This watershed event established the conceptual underpinnings for environmental politics and debate in the 1990s by reframing the problem of the natural environment as one of sustainable development. In the wake of this reframing, a new practice in environmental management emerged – that of green alliances or partnerships between business and ecology groups (Westley & Vredenburg, 1991, pp. 71-72). These alliances, considered one of the ten most significant trends in environmental management and the greening of industry (Gladwin, 1993, p. 46), appeared to signal a sea change in the way business, as well as environmentalists, could respond to the ecological impacts of firms’ economic activities. Indeed, environmental partnerships offered both business and ecology groups the potential for a new rhetorical stance. Business communication scholarship has identified a variety of rhetorical strategies adopted by corporations in the face of environmental controversy: defensiveness and apologia (e.g., Ice, 1991; Tyler, 1992), competing information campaigns (e.g., Lange, 1993; Moore, 1993), or retreat (e.g., Seiter, 1995). Green alliances provide business with an alternative to these strategies. Through eco-partnership, a firm can adopt, at both material and symbolic levels, a proactive approach toward the natural environment; its posture vis-a-vis environmentalists, or at least a wing of the environmental movement, can be collaborative rather than conflictual. On the other hand, green alliances offer environmentalists the possibility of direct influence over business practice and an alternative to – or as Fred Krupp, leader of the Environmental Defense Fund (EDF) and an early proponent of eco-business collaboration, would have it, a tool in addition to – the jeremiad (Killingsworth & Palmer, 1996; Slovic, 1996). While eco-alliances have been discussed in the environmental management and green marketing literature, they have not been so far studied as business communication. This paper presents a case study of the rhetorical aspects of an early green partnership, the 1990-1991 precedent-setting alliance between McDonald’s Corporation, the leading quick-service restaurant chain, and EDF, a United States-based mainstream environmental organization. McDonald’s and EDF formed a joint task force that publicly released a six-month study of McDonald’s entire range of packaging and materials management practices. The partnership is most widely known, however, for the fact that three months into the study, at the last minute, and under pressure from EDF, McDonald’s abandoned the polystyrene boxes (called clamshells) it had traditionally used to package Big Macs and other sandwiches. This dramatic event tended to overshadow other – arguably more important, and certainly less controversial – work, including a 42-step action plan to lessen the environmental impacts of McDonald’s business. My study seeks to recontextualize the packaging decision, considering it within the broader dynamics of the partnership and within the context of McDonald’s prior corporate environmental advocacy. Further, it locates the McDonald’s-EDF partnership within the broader realm of environmental politics in the late 1980s and early 1990s, an arena where nonprofit environmental groups began to play a new and important role. I focus on the symbolic and discursive aspects of the partnership. Relying on public relations material released by McDonald’s and EDF before and during the partnership, as well as contemporaneous and subsequent news accounts, I show the variety – and the variability – of rhetorical strategies adopted by McDonald’s in its attempt to construct itself as green in the eyes of its consumers and publics. I also explain the rhetorical approach used by EDF in its struggle to expand the scope of legitimate action by environmentalists to include collaboration with businesses. Alliances that have arisen between environmentalist groups and businesses in the last decade represent a shift in the arm’s-length, or adversarial, relationships among institutional stakeholders (business and environmentalists, environmentalists and government, government and business) traditionally concerned with problems of the natural environment (Long & Arnold, 1995; Milne, Iyer, & Gooding-Williams, 1996; Westley & Vredenburg, 1991). The new relationships have been described as path breaking and innovative (e.g., Coddington, 1993; Long & Arnold, 1995; Ottman, 1994; Wasik, 1996). Typically, they are distinguishable from the prior charitable (e.g., donations to or sponsorships of environmental causes) and commercial relationships (e.g., calendars, T-shirts produced for environmental groups) because they engage the expert knowledge of the environmental group and involve it, to varying degrees, in joint problem solving or strategic decision making with the corporate partner (Clair, Milliman, & Mitroff, 1995). In this category are green product endorsements, audits by environmental groups of business programs or practices, and joint projects of the type engaged in by McDonald’s and EDF, where the corporate partner’s business practices are evaluated and improved according to ecological criteria. In 1989-1990, McDonald’s was the leader of the fast-food industry, with worldwide operations employing approximately 500,000 people in 11,000 restaurants and serving 22 million customers a day. At the time EDF approached McDonald’s, its entanglement in controversy over its packaging frustrated the company. From EDF’s perspective, McDonald’s leadership position, its problematic history of waste management, and the iconic value of waste management as an environmental issue made the company an attractive candidate for partnership. EDF saw significant opportunity for both environmental action and a major, high visibility, opportunity to test its innovative approach to environmental problem-solving through corporate partnerships. On the other hand, EDF’s positioning as a mainstream environmental group made it an attractive ally. McDonald’s earlier attempts to talk with the more radical Citizens Clearinghouse for Hazardous Waste (CCHW), one of the ecology groups organizing grassroots actions against the company, had failed (Gifford, 1991). Below I briefly summarize the background histories of McDonald’s and EDF before turning to a description of the partnership. With environmentalism on the rise among the general public in the 1980s, consumer-driven businesses were particularly subject to and sensitive about public pressure (Livesey, 1993a, pp. 2-4). Plastic had been demonized by several environmentalist organizations including the grassroots groups Greenpeace and CCHW. The use-and-dispose philosophy at the core of McDonald’s business and its distinctive plastic clamshell sandwich boxes, which helped to make the company one of the largest single users of polystyrene in the United States, had made McDonald’s a continuing target of ecology groups (Livesey, 1993a, p. 4). Throughout the late 1980s, McDonald’s instituted and publicized a number of environmentally positive steps in its domestic operations (see Figure 1). It reduced consumption, for instance, by using lighter weight paper in straws, paper bags and other items and recycled paper and cardboard packaging. In 1987, it switched from polystyrene (used for the clamshells) blown with CFCs, the family of chemicals which destroy the ozone layer, to plastic foam that used hydrocarbon blowing agents (Annual Report, 1989, pp. 10-15). In 1989, the company instituted a pilot program in 450 New England stores to recycle its plastic clamshells (Holusha, 1989; Livesey, 1993a, pp. 12-14). In April, 1990, it committed $100 million, or one quarter of the company’s annual building and remodeling budget, to buy recycled materials for restaurant construction, remodeling, and operations under a program called “McRecycle” (Livesey, 1993a, pp. 13-14). In 1989 and 1990, McDonald’s bolstered its environmental management practices with a proactive public relations campaign. The centerpiece was the 1989 Annual Report, which highlighted the issue of the natural environment. McDonald’s also offered in-store flyers to educate customers about the company’s environmental management practices, policies, philosophies, and positions on particular issues such as rainforest beef and the ozone problem. Brochures on environmental topics, including packaging, were available from its public relations department. In addition, McDonald’s worked with several different environmental and nonprofit groups (e.g., the World Wildlife Fund and the Smithsonian Institution) to coproduce elementary school materials on the environment. Despite its efforts, the company continued to be criticized. Twenty years after being founded in 1967 as a grassroots group that litigated against the use of DDT on Long Island, EDF had become one of the Group of 10 mainstream U.S. organizations (Clair, Milliman, & Mitroff, 1995, p. 168; Dowie, 1995). With a budget of close to $16 million (Reinhardt, 1992, p. 6), its staff had expanded to include 110 lawyers, economists, and scientists; membership was greater than 200,000 (Livesey, 1993a, p. 14) and a Harvard Business School graduate served as chairman of its board of trustees (Reinhardt, 1992, p. 6). The scientific cultureof its early days gave EDF a basis for positioning itself as a technical expert. In the late 1980s, its Executive Director Fred Krupp (1986) began to propose “coalitions of former enemies” (p. 34), that is, coalitions with corporate America, as an important tool for achieving environmental change. EDF thus differentiated its role within the competitive environmental movement, a move for which it was criticized by CCHW and other more radical groups who said that EDF had become too close to corporate interests and too willing to compromise (Reinhardt, 1992, p. 5; see also Dowie, 1995, pp. 105-124). Before the McDonald’s partnership, EDF had pursued various joint projects with organizations and groups ranging from the World Bank to the electric utility industry to western water users (Reinhardt, 1992, p. 4). Further, like McDonald’s, EDF had participated in multi-party negotiations organized by the Coalition of Northeast Governors to develop waste management guidelines for New England. Thus, it had built expertise in the area of packaging and waste management and had enjoyed a working relationship with McDonald’s representatives before the task force was initiated (EDF Fact Sheet, August 1, 1990). The task force history had three phases: the announcement of the McDonald’s-EDF partnership on August 1, 1990; McDonald’s decision to abandon its clamshell packaging on November 1, 1990; and the release of the joint task force study on April 16, 1991. A brief history of the partnership follows (see Figure 2). The McDonald’s-EDF joint task force on waste reduction was the outcome of a year of EDF-initiated dialogue with the company (Reinhardt, 1992, p. 9). The eight-member group included representatives from McDonald’s, EDF, and The Perseco Company, McDonald’s exclusive packaging supplier. Shelby Yastrow, General Counsel and Senior Vice President of Environmental Affairs at McDonald’s, along with EDF Executive Director Fred Krupp, oversaw the group (McDonald’s Corporation & EDF Press Release, August 1, 1990). The alliance was structured by a formal written agreement (McDonald’s & EDF Final Report, 1991, pp. 5-6) that defined the issues the task force was to consider and set up some ground rules. Designed to anticipate potential conflict, the agreement included an escape clause in case of disagreement, preserved the parties’ rights to note publicly their differences, provided for the parties’ financial independence, and permitted each organization to pursue its own public relations and advocacy agendas on the environment during the period of the task force. McDonald’s, however, was barred from publicizing the task force in marketing materials without EDF’s prior approval; EDF was not so restricted. McDonald’s Yastrow and EDF’s Krupp held a joint press conference at the National Press Club in Washington, DC, to announce the “Landmark Task Force” (McDonald’s Corporation & EDF Press Release, August 1, 1990, p. 1). They promised a six-month study and public release of recommendations and results. McDonald’s committed itself to following the recommendations “where feasible” (p. 1). On November 1, 1990, three months into the partnership, McDonald’s made an 11th-hour decision under pressure from the EDF to discontinue its clamshell sandwich packaging. McDonald’s prior plan to expand its New England plastic recycling program nationwide was abandoned. McDonald’s decision received much positive press coverage. A January 1991 Advertising Age poll showed that McDonald’s was perceived as more environmentally responsible than its competitors, though none of them were particularly highly rated (cited in Livesey, 1993b). At the same time, however, the decision was criticized by three groups: environmentalists who saw both paper and plastic as environmentally harmful (e.g., Beyea quoted in Holusha, 1990, p. D5); plastics and recycling proponents (e.g., Rayport & Lodge, 1990) who said that McDonald’s had “caved in” to consumer pressure and done the “wrong thing” for the environment (p. B5); and segments of the business press who saw McDonald’s 11th hour about-face as a “cave in” to EDF’s strong-arming (Grimm, 1990, p. 4). The plastics industry mounted an intense pro-plastic advertising effort and advocacy campaign, but its efforts were described by the media as “too little, too late” (Ryan, 1990, p. C3). EDF justified the decision on scientific and economic grounds, responding to critics through various channels, including letters to the editor (Denison, 1990b), op-ed pieces (Denison, 1990c), and memoranda which it circulated to “interested parties” (Denison, 1990a, p. 1; see also Denison, Prince, & Ruston, 1990). In April 1991, the McDonald’s-EDF joint task force released its final product, a corporate waste reduction policy and a comprehensive waste reduction action plan with 42 initiatives. Many real environmental improvements were generated by the task force. For instance, environmental criteria were integrated into corporate packaging decisions which before had been driven by quality and cost criteria (see McDonald’s Final Report, 1991). The media mostly praised the results of the alliance (see Reinhardt, 1992, p. 14), and the story was recycled over several years (e.g., “Management briefs,” 1992; Gifford, 1991; Gutfeld, 1992). Ultimately, as I have described above, the partnership entered the green business literature as a milestone marking a change in the relationships between business and environmental groups (e.g., Cairncross, 1995, pp. 181-182; diBenedetto & Chandran, 1995, p. 272; Long & Arnold, 1995, pp. 28-29; Lozada & Mintu-Wimsatt, 1995, p. 181; Wasik, 1996, p. 28, pp. 71-74). I analyze below McDonald’s 1989 Annual Report; McDonald’s Vice President of Environmental Affairs Yastrow’s and EDF Executive Director Krupp’s speeches announcing the partnership at the press conference on August 1, 1990; the announcement of the packaging switch on November 1, 1990 and its aftermath; and the public release of the Final Report of the joint task force. I then turn to a discussion of the case. McDonald’s 1989 annual report represents an aggressive attempt by the company to manage the public discourse around the company’s role as an environmentally responsible corporate citizen and construct itself as green. The report belongs to the category of epideictic advocacy (e.g., the Mobil Oil campaign), the discourse of praise and blame that is commonly used to establish or consolidate value premises, especially in corporate issue management campaigns; such discourse often serves as a basis for later persuasive efforts (Cheney & Vibbert, 1987, p. 183; Crable & Vibbert, 1983). Epideictic rhetoric works by building on shared premises and borrowing from values and beliefs embedded in the common culture. In this case, given the new ecological awareness of the public, McDonald’s positions itself as having concerns ecological and practical, social as well as economic. As described by the media, the 1989 Annual Report looks “more like an Audubon Society brochure than a financial statement” (Horovitz, 1991, p. D2). Nature pictures, poetry, and quotations from national and international figures prominent in the environmental movement (e.g., Gro Brundtland) are interspersed throughout the report, along with product and financial information. The cover contains a four-page foldout picture of the Northwest American forest with a quotation from Chief Seattle about man’s proper relationship to the earth. The report itself is “dedicated” to a “discussion of the [environmental] challenges which lie ahead” (McDonald’s Annual Report, 1989, p. 2). The discussion is contained in a 10-page supplement. We believe the environmental challenges facing the world can be addressed and solved by working in partnership with people wherever we do business. . . .
We believe each of us can make a difference. To do that we need to understand the issues, discuss the alternatives, and develop practical and economic solutions. This letter is as notable for what it omits as for what it says. It at once implicates the reader, inviting dialogue, and yet leaves the situation ambiguous, particularly vis-a-vis the company’s responsibility and intentions. What, for instance, will become of any reader comments? To whom should they be directed? How should a discussion on the environment be orchestrated? Indeed, who exactly is being invited into the dialogue? While McDonald’s injects an appeal to rational discourse, in fact, the primary strategy here is to avoid hard issues through implied congruence between “people’s” (ours, the readers’?) and McDonald’s values, beliefs, and hopes. Rational argument, however, might question whether the kind of “difference” McDonald’s, a giant corporation, can make is equivalent to what other “people” can do. Further, in what specific ways will preserving the environment be good (or, what is left unstated, bad) for McDonald’s as compared to other “people”? Here we see an example of what Cheney (1992) has referred to as the “decentering” of the individual – in this case, the corporate persona – through corporate rhetoric that “complicate[s] matters of authorship, voice, attribution, and responsibility” (p. 176) and de-emphasizes McDonald’s role as a multinational company whose decisions and actions have immense impact on the environment and transcend – and in many cases control – those of millions of individual “natural persons.” The shareholders’ letter thus anticipates a key rhetorical strategy used in the environmental supplement to the report, to which I turn next. The supplement contains several distinct parts: an answer to a letter from Dan Getty, an 11-year-old boy who calls for responsible action from McDonald’s (Annual Report, 1989, pp. 7-8); a general outline of McDonald’s philosophy and historical commitment to “responsible [environmental] conduct,” including company founder Ray Kroc’s mandate to crews to clean up litter near McDonald’s restaurants (p. 9); three sections addressing facts and expert opinions about solid waste management, resource conservation, and recycling (pp. 10-15); and a collective call “to Help [sic]” in solving the challenge of the environment (p. 16). The letter of response to 11-year-old Dan Getty illustrates several of the rhetorical strategies McDonald’s uses to achieve a symbolic identification with its customers and the general public. First, McDonald’s constructs itself as a naive, non-expert, and innocent individual actor. Like Dan Getty and “people of all ages,” McDonald’s is “asking questions about our environment” and learning that the answers to environmental issues are “complex” (Annual Report, 1989, p. 7). It eschews inaction in the face of complexity: “It’s easy for each of us to claim we’re not responsible for these complex forces. But then we have to ask, ‘Who is?’ “(p. 8). At the same time, it sounds a cautionary note: It is important “to do what is environmentally sound, when the responsible course of action becomes clear” (p. 7). Who or what will provide clarity leading to action is left ambiguous. Second, McDonald’s positions itself as one of a community of stewards of the earth: “Each of us, knowing what we have at stake, must make a commitment to a course of action that will preserve and enhance the environment we hold in trust for future generations. . . . You can count us in” (p. 8). Through appeal to the words of Gala theory originator James Lovelock – “It’s personal action that counts” (quoted in McDonald’s, 1989, p. 8) – and founder Ray Kroc’s dictum – “None of us is as good as all of us” (quoted in Annual Report, 1989, p. 8) – the boy’s call for help from McDonald’s is transformed into a call for everyone to act. The actions and identification that it invites are personal. Identifying with its customers, McDonald’s asks that they identify with it. McDonald’s puts itself on a level with the 11-year-old. Thus, through rhetorical sleight, of-hand – in Cheney’s (1992) words “the sheer juxtaposition of images . . . as a substitute for reasoned discourse, for argument” (p. 174) – McDonald’s equates natural persons with the corporate persona, and power differences – the differences between producer and consumer, corporate giant and small child – are made to disappear: The people at McDonald’s, no different from people everywhere, must act to save the earth. Of course, at one level, McDonald’s people are like people everywhere and, like them, probably hold a range of opinions about the problem of the natural environment But at another level and at the same time, McDonald’s people constitute a corporate body. The distinctions and tensions of this duality are ridden over in the corporate writing here. The next section of the annual report supplement tells a different story: that of McDonald’s the corporate citizen who has relied on experts for sound advice. McDonald’s defends its environmental record by listing specific actions that it has taken to manage waste and conserve resources by reducing, reusing and recycling materials. It cites experts who support its position on plastic packaging and who point out the small contribution of the entire quick-service restaurant industry to America’s waste. It also criticizes “the ‘Not In My Back Yard’ syndrome – or NIMBY” (for instance, people in McDonald’s communities who opposed company incinerators in their neighborhoods) as posing barriers to responsible waste solutions (Annual Report, 1989, p. 11). While the story that is told attempts to validate McDonald’s waste management practices, at the same time it implicitly places beyond the reach of criticism certain core values of McDonald’s business, among them convenience (throw-away) and low-cost mass consumerism. Within the frame it creates, broader resource issues related to consumption cannot be raised. The problem of the environment is conceptualized narrowly as one that can be managed through appropriate technology and good habits, like keeping the sidewalk clean, concepts that fit well with American individualistic beliefs about how problems can best be addressed. In the closing section of the report, McDonald’s again emphasizes individual personal action: Plant a tree, switch off a light, recycle a clamshell. Yet, it also describes itself as a proactive corporate actor “look[ing] for opportunities to work with individuals, public officials, and other companies, as well as with the communities we serve.” What is also uncertain here is whether McDonald’s is a proactive leader or reactive follower. This ambiguity is better understood by considering the annual report in the context of external political pressures on the company at the time (Deetz & Kersten, 1983). Throughout the middle and late 1980s McDonald’s faced threats of local laws and litigation restricting use of plastic packaging, picketing of its stores, and other grassroots actions. CCHW, one of the groups opposing McDonald’s, had launched a “Ronald McToxic” campaign, effectively appropriating (or, in McDonald’s terms, misappropriating) the company mascot, the clown Ronald McDonald, to make him an emblem of betrayal and doom. CCHW thus subverted the company’s fun-and-friendly image, a tactic that enraged the company. CCHW and other radical groups organized a children’s campaign to mail used clamshells to McDonald’s headquarters, thus quite effectively politicizing children. Finally, the packaging issue stole the focus from the product – food – and kept it instead on the box. Although the annual report rhetorically constructs McDonald’s as ready to collaborate, in practical and political terms, the company had already assumed a posture of opposition and conflict. Its responses were essentially ad hoc, reactive, and defensive – a classic pattern under the command-and-control paradigm. From this perspective, we can see the annual report as McDonald’s attempt to achieve symbolically what was elusive in fact. Through language, it seeks to reclaim control, depoliticizing environmental issues by reconstituting them as personal and part of a universal goal to do “the right thing for the environment.” It offers individual action as a counter to political action: Empowerment is achieved by turning off a light, planting a tree. Furthermore, McDonald’s goal of “preserving and enhancing the integrity of the environment” because “it benefits everyone” (Annual Report, 1989, p. 2) has to be distinguished from the win-win rhetoric of market-based environmentalism. The general benefit of a healthy environment is not the same as specific economic advantages, such as cost savings from reduced use of materials or increased sales, which are benefits derived from environmental management programs. Indeed, at the same time that McDonald’s was carrying out environmental initiatives, its spokespersons were claiming that market research results showed no effect on McDonald’s customers’ behaviors resulting from environmental awareness (Yastrow, August 1, 1990, Press Conference). This is not the discourse of market-based environmentalism, but rather the older model where the corporation faces (and resists) restrictive legislation, and its environmental efforts fall under the rubric of general good citizenship and corporate social responsibility. We can nevertheless view McDonald’s from a different perspective at this juncture. Following Weick (1979), we can see that businesses, as well as other institutional actors, “enacting” the environments in which they participate are both subjects and objects of their own perceptions (Weick, 1979, p. 165): Eventually they “stumble” over their own enactments (p. 167). This is especially true of large organizations. The more McDonald’s constituted itself as “green,” the more it was required to accommodate environmental issues affected by its business practices. McDonald’s attempts at recycling, resource reduction, incineration, and the like were not simply symbolic. The company was both the subject and the object of its own eco-discourse. The emerging storyline it constructed had positive environmental effects at the material level, in addition to opening the company to potential dialogue with EDF. Krupp and Yastrow made prepared statements at the August 1990 press conference announcing the McDonald’s-EDF partnership. Their speeches were followed by a question-and answer session with the press. The different rhetorical positioning of the partners shows key differences in the ways they chose to construct themselves publicly. Krupp opens the press conference. In contrast to McDonald’s strategy in the letter to Dan Getty, where responsibility for the environment is equally distributed and personally focused, Krupp distinguishes between corporate and individual action (although he also includes individuals within his mandate to change). His speech begins by scolding: “America is the world’s trash king . . . McDonald’s is part of the problem.” He sets EDF up as morally superior: “EDF is committed to changing these wasteful ways. America can no longer be a throwaway society . . . We’re determined to see McDonald’s make fundamental changes in the way they [sic] operate. We’re determined to see the restaurant industry, industry in general, and each of us as individuals make fundamental changes in the way we operate” (McDonald’s & EDF, August 1, 1990). Krupp also puts EDF on the moral high ground and takes credit for EDF’s leadership role in initiating this relationship. It is not clear when he says “we” (“We’re not just talking about fundamental changes in the way one corporation does business, we’re talking about substantially reducing the amount of trash 22 million people throw away every day”) whether the rhetorical community to which he is referring is EDF and McDonald’s, or EDF and the American public; or perhaps, he is simply speaking for EDF itself. This rhetoric, a mild form of the jeremiad, is typical of earlier environmentalists (Slovic, 1996). It was a style probably personally familiar to Krupp, himself a product of the 1970s. In other venues, however, when reflecting on the practice of market environmentalism, Krupp and others of EDF (e.g., Golfman quoted in Coddington, 1993) specifically abjure “preaching” (p. 186). As they appear to recognize, it is not the ethos of the scientists/consensus builders of market environmentalism of the 1980s (see Killingsworth & Palmer, 1996, pp. 34-35). Curiously, here where Krupp is initiating a collaboration, he chooses rhetoric more associated with the old conflictual mode. McDonald’s role as corporate leader, however, is the source for praise as well as blame; Krupp uses it as the pivotal point in his speech: “McDonald’s can help because they are a leader. They are number one in their business. . . . It’s time to turn the golden arches green.” The message here is that McDonald’s can reform (that is, EDF will reform it); it can transform itself from restaurant industry leader to environmental leader, again something very different from anything that an 11-year-old Dan Getty or any individual can achieve. Krupp not only stresses EDF’s financial independence (an issue that had troubled other green alliances such as the one between Pollution Probe and Loblaws), but also appeals to images of conflict and war. Krupp repeats this “heavy artillery image” in the question-and-answer period, when he reasserts EDF’s right to disagree with McDonald’s over substantive issues. In the same context, he talks about EDF putting its recommendations “out in the sunshine, and [letting] all of you know what they are. . . . There’s power in the court of public opinion.” Thus, while the desire is for dialogue and partnership, it is backed up by not-so-veiled threats of conflict, litigation, and public controversy. Here, as in The Wall Street Journal op-ed piece, where he talked about the market-based approach, Krupp (1986) leaves room for the counter-discourse and the practices of radical 1970s environmentalism. Yastrow recognizes the difference of perspective (he called McDonald’s and EDF “the odd couple”), but he minimizes difference by generalizing the goal as “everyone want[ing] this to be a better place.” The use of “we” is clearly intended to close social and political gaps. Yastrow’s language exhibits some of the decentering strategies noted above in the annual report, employing, for instance, the mysterious “we” – as in, “We all want the same thing.” Nevertheless there are differences. Here, as compared to the annual report, the “we” can be realized at both symbolic and material levels through partnership with EDF. A real forum for dialogue has been created, although whether that forum is a democratic or not can be argued (see Hajer, 1995). Transparency and openness are critical features in market environmentalism. Although, like Krupp, Yastrow responds to the need for public accountability, his tone is altogether different. Krupp’s metaphors refer to exposure: he talks about “sunshine” (analogous to sunshine laws which give the public access to governmental decision making) and the “court of public opinion.” Yastrow, however, makes the voluntary gesture; he points to the EDF partnership as “[something] you’ll [the press] be able to see for yourselves whether we can meet [the challenge]. We put our money where our mouth is.” He says that McDonald’s, under fire, does not “go into hiding but . . . into a fish bowl”; McDonald’s doors and drawers are opened to EDF. McDonald’s is open also, in the figurative sense, to listening and learning. Yastrow’s metaphors are aimed at trust-building which is directed toward the public through EDF and the media. Yastrow expresses optimism about cooperative action, saying, “It seems that this is working already.” He talks about feelings, as well as expertise; in contrast to Krupp’s moralism, he appeals to sentiment: “We’re all, at least over at McDonald’s, we’re very excited about it.” He also appears to borrow readily from the discourse of market environmentalism when he talks about McDonald’s becoming a “laboratory” for scientific experiment, while at the same time hoping that McDonald’s can teach the scientists something about running a business. Yastrow thus explicitly disavows the old ways. Faced with disagreement, he says there will be no “duels.” Unlike Krupp, he rejects the conflict scenario; instead, he posits rational discourse as McDonald’s weapon of choice: “If I can’t convince Fred Krupp or Richard Denison that we should not use Wedgwood china, then I won’t be able to convince the American public, or you [the press], and then I better use it.” Persuasion will be the tool, and collaboration the mode, of this relationship. In summary, Yastrow talks, for the most part, in the language of market environmentalism, laced with a bit of sentimentalism, while Krupp’s public entry into the new relationship with McDonald’s borrows more evenly from both old and new discourses. He is both scold and scientist/expert/innovator; he is a collaborator who holds “heavy artillery” in the wings. The difference between Yastrow and Krupp reflects the differences in their rhetorical goals: McDonald’s must achieve credibility by transforming itself. EDF, on the other hand, has to keep its credibility with its original constituents by maintaining its identity as a public interest group while brokering a new identity with the corporate world. At the early stage in their relationship, the symbolic convergence (Borman, 1983) between the EDF’s and McDonald’s stories is strained. In late October 1990, EDF’s earlier, merely rhetorical threat of conflict and public exposure was put to the test when McDonald’s, without consulting the joint task force, decided to extend its plastic clamshell recycling program nationwide (Holusha, 1990, p. A1). Even less than a month earlier, the New England recycling program had been extended to Los Angeles with much fanfare. We can speculate that supplier relationships, issues of quality, and perhaps also a conviction by some inside the company that its year-and-a-half-old recycling program was environmentally good were behind the pro-clamshell faction’s desire to keep the polystyrene packaging. Krupp nevertheless called on CEO Rensi to consider an alternative proposal from the task force and threatened to oppose McDonald’s publicly if it went ahead with its decision. According to the public record (Gifford, 1991; “Greening of golden arch,” 1990; Holusha, 1990), there was disagreement inside McDonald’s about the decision. CCHW and a large number of environmental groups that had crusaded against plastic were on EDF’s side. However, as mentioned above, the decision created controversy and drew negative reaction from some quarters. Because of the internal controversy at McDonald’s, EDF appears to have somewhat lost control over the communication strategy for announcing the packaging switch and did not have time to prepare to deal with the backlash in the press. Most importantly for the point here, however, is that EDF was prepared to oppose McDonald’s and contemplate a disruption in the relationship – that is, it was prepared to act publicly in the old oppositional mode to force an outcome that it believed was right in terms of the natural environment. At the same time, EDF talked in the language of the new environmentalism; Krupp positions McDonald’s action as an “environmental touchdown” and “the beginning of a new era of environmental problem solving” (quoted in Livesey, 1993b, p. 103). 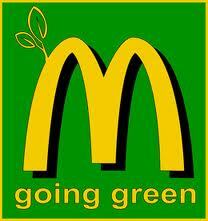 McDonald’s did not, however, take on the role of proactive environmental leader. The company backed away from a high-profile joint press conference with EDF, instead releasing a separate press statement and conducting, jointly with EDF, one-on-one interviews with selected members of the press. More importantly, the company refused to endorse the environmental merits of its new sandwich packaging over the old clamshells. In a public statement about the matter, McDonald’s CEO Rensi said, “Although some scientific studies indicate that foam packaging is environmentally sound, our customers just don’t feel good about it” (quoted in Livesey, 1993b, p. 103). By retreating from its position as environmental innovator to its more comfortable role of business marketer, McDonald’s could save face with its suppliers, many of whose businesses we can assume were seriously affected by the packaging change, as well as with those inside McDonald’s who may have been committed to the clamshell recycling programs they had been asked to implement in New England and Los Angeles. At this critical juncture in the relationship, McDonald’s publicly constructed itself not as “green” but as customer-centered. This was a public relations loss for EDF. The press release (McDonald’s Corporation & EDF Press Release, April 16, 1991) announcing the publication of the task force study positions it as “one of the most comprehensive solid waste reduction plans ever developed” and calls the partnership “unprecedented” (p. 1). In the press release, Richard Denison, a senior EDF scientist on the task force, asserts that McDonald’s has demonstrated genuine commitment to the environment through its “willingness to elevate waste reduction considerations to the same level as other company fundamentals like cleanliness and quick service [part of Kroc’s original operations criteria]” (p. 2). In the same press release (April 16, 1991), McDonald’s spokesperson Keith Magnuson says that the task force’s accomplishments included action, not just the recommendations and options as originally envisioned. Magnuson claims, “We want to do the right thing for the environment. . . . The changes that our customers will see-as well as those behind the counter – will have a positive and long-lasting effect on the environment. The announcement of the task force results appears to provide a moment of convergence in the relationship between McDonald’s and EDF; they had come to speak the same language. The version of the partnership played in the popular press at almost the same time, however, is of EDF as a David to McDonald’s Goliath. People magazine, for instance, featured an article on the McDonald’s-EDF alliance (Reed, 1991) showing a picture of a tiny Fred Krupp atop a giant clamshell. Later, Rolling Stone (Gifford, 1991) and The Economist (“Management briefs,” August 29, 1992) ran detailed stories about the EDF-McDonald’s partnership, foregrounding the story of the overthrow of the clamshell. Although we have to take account the way in which news values and the media predilection for drama and conflict distort environmental messages, the clamshell story nevertheless provided EDF with a way to enter the public imagination as heroic defender of the environment, an image appropriate to the old paradigm. EDF could also thus continue to ride the anti-plastic sentiment that had been whipped up by large numbers of environmentalists. duels. What function does EDF’s talk of conflict serve at the beginning of the collaboration? How does the press image of EDF as victor serve the ecology group? Why did McDonald’s retreat to a customer-centered rationale when it dropped the clamshell, even as EDF tried to position it as an environmental leader? I argue here that market environmentalism does not simply overwrite the discursive field. Rather, the counter and subordinate discourses serve necessary functions within the partnership, as described below. (c) it helps the corporation to manage identity – “the question of what the organization ‘is’ or ‘stands for’ or ‘wants to be'” (Cheney & Christensen, in press). More recently, particularly in respect to this third dimension of identity, public discourse has come to be seen as also having an internal function: it helps the organization to identify itself to itself (Cheney & Christensen, in press). As Cheney and Christensen point out, an organization, through a reflexive process, seeks both to influence its external audiences and to take them as an ideal reference point by which to confirm its merits and good intentions (through marketing and opinion polls and the like). Where issue management is involved, as in this case, issue and identity thus become very much entwined. Organizations, however, operate with other actors in settings that are socially constructed (Aldrich, 1979; Smircich & Stubbart, 1985; Weick, 1979) and are thus subject to discursive struggle. The ecological crisis represents a domain of discourse struggle in the 1990s in which the parties to the green alliance here were implicated. In this case, McDonald’s was struggling with other business corporations, environmentalist groups such as EDF, Greenpeace, and CCHW, and public policy bureaucrats over the way in which corporations were to be socially and politically positioned as actors engaged in the problem of the natural environment. More specifically, McDonald’s fought to control the representation and perception of its packaging policies and their impact on the earth. Similarly, EDF, along with other mainstream ecology groups, sought to claim legitimacy for a new kind of action by environmentalists. And, both sides sought to present themselves as reasonable and progressive to a public for whom environmental issues had become salient. In terms of identity management, McDonald’s needed to escape the negative image that resulted from two interrelated issues: (a) the demonization of its plastic clamshell packaging by groups within the environmental movement; and (b) its symbolic embodiment of values (use-and-throw-away consumption) that were antithetical to ceo-awareness. The 1989 Annum Report sought to achieve this goal within the conventions of corporate public advocacy. As a kind of report card on the company’s own activities, it functioned as a “metatext” (Cheney & Christensen, in press) by its very existence attesting to the seriousness of McDonald’s environmental effort. But McDonald’s faced a major stumbling block: because there was no infrastructure to support recycling of the clamshells in any real way, there was a critical gap between its advocacy and its practice. At the symbolic level, McDonald’s saw partnership with EDF as a good way to close this gap. Closing the gap by forming the partnership with EDF, however, had the potential to draw McDonald’s into a political arena, an area that corporate issue management is designed to avoid and a setting where EDF was clearly more practiced and more confident about asserting control. In fact, McDonald’s management publicly positioned the company as apolitical. As CEO Rensi, was quoted as saying, “I can’t solve nuclear war, but I can run a hell of a restaurant” (Livesey, 1993a). McDonald’s had a tricky task: it had to be of the partnership but not swallowed by it. It had to walk the boundary of the political world of environmental politics, allowing EDF to act as its surrogate, but not its subjugator. That struggle is played out in the announcement of the partnership in the banter between Yastrow and Krupp, described above, about “turning the golden arches green” and in the packaging switch. Compromise, not conversion, is what McDonald’s sought, was the company’s motive in selecting EDF as partner, and was what they ultimately got, the rhetorical skirmish over green and gold and the actual skirmish over the clamshell packaging notwithstanding. As Yastrow later reported, “I knew they wouldn’t try to talk us into doing something if it was economically unreasonable. Fred [Krupp] wouldn’t come in and ask us to go to Wedgwood china.” (Gutfeld, 1992). Nevertheless, when McDonald’s came too close to being subjugated in the clamshell packaging face-off, it retreated from the environmental field. Taking cover in its old and familiar identity of marketer, it rationalized its decision as doing what its customers “feel good about” (Rensi quoted in Livesey, 1993b, p. 103). EDF, on the other hand, wanted to establish a niche for itself within the very competitive environmental movement. Proof of success, highly publicized, was its primary tool for building membership and economic (foundation) support. Moreover, a primary goal within the partnership was to expand the notion of what constituted an “environmental success” to include ecology groups working with business to produce change in corporate environmental practices. By its association with McDonald’s, however, EDF’s historic “watchdog” role, which is rooted in notions of the independence of non-profit environmental groups from business and government interests, was implicitly threatened (Milne, Iyer, & Gooding-Williams, 1996). The partnership brought with it the tension between symbol and substance that has shadowed the entire historical relationship between business and the environment, a history where small gestures have routinely been presented as transformational events, where basic questions about consumption are swept under the carpet, and where big business has been perceived as exploiting environmental concern in order to make money (e.g. Coddington, 1993, pp. 201-205; Ottman, 1994, pp. 5357). EDF had to defend itself against claims of “selling out” to corporate interests (see Clair, Milliman, & Mitroff, 1995, p. 177). Critical to its task therefore was maintaining its political advocacy role, the aspect that makes environmental groups most threatening to business. Without such a positioning, EDF could be seen as nothing more than environmental consultants to business, a position it explicitly rejected (Reinhardt, 1992). Furthermore, it would put at risk the very credibility that was of symbolic value to its corporate partner, and thus a key purpose of the partnership. EDF and McDonald’s approached the partnership with organizational goals that were overlapping yet in tension. The public alliance between these two organizations was risky insofar as it pushed each across boundaries where it was difficult for it to comfortably reside. While attempting to construct identities that borrowed from the new paradigm of market-based environmentalism, the partners also needed to remain recognizable to themselves and their constituents. These factors help to account for the ambivalence heard in the rhetoric surrounding this relationship, and they explain the partners’ needs to draw on both old and new discourses of environmentalism. Finally, we need to see this green alliance in the larger context of the discourse struggle around the natural environment. The storyline of sustainable development is marked by “an astonishing collection of claims and concerns brought together by a great variety of actors” (Hajer, 1995, p. 1; see also Anderson, 1997). Within five years of the Brundtland report over 40 working definitions of the term sustainable development had emerged (Hajer, 1995, p. 1). Eco-business alliances are one sort of practice inhabiting the discursive field; they help to legitimate a particular concept and practice of sustainability, market-based environmentalism, but they cannot resolve the conflict on this contested terrain. Market-based environmentalism finds its necessary foil in command-and-control environmentalism; it is part of what helps to maintain the “sustainable” aspect of sustainable development. Thus the partnership drew into itself the contradictions, conflicts, and tumultuousness found within the discursive field, giving rise to the rhetorical ambivalence displayed within the McDonald’s-EDF alliance. Notwithstanding Bullis’ (1997) recent criticism of a social constructionist approach toward the natural environment, given the important symbolic functions of green alliances and their role in the evolving discourse struggle around the problem of the natural environment, I believe that a social constructionist perspective will contribute to a critical understanding from a business communication perspective of this important new phenomenon-green alliances. I have sought to open this theoretical avenue by analyzing the rhetorical dynamics of one specific partnership viewed through the lens of discourses of command-and-control and market-based environmentalism. I thus hope to illuminate, at the level of a particular relationship, the complexities and paradoxes, contradictions and fragmentariness of the discursive struggle around the natural environment and to demonstrate how the actors in that struggle are both constrained by, and constitutive of, the struggle itself. To begin with, the partnership agreement between McDonald’s and EDF limited the debate; that is, the issues of fast-food convenience and the environmental harms caused by a commodity culture were clearly beyond the scope of the alliance. Thus, the partnership was by its nature a compromise. Paradoxically, the clamshell decision, which appeared to threaten the partnership and opened EDF to a debate in the press between expert and counter-expert over whether McDonald’s decision was a “win” for the environment as EDF claimed, also provided a cover for compromise and collaboration. Winning on the plastic issue proved that EDF would stay aligned with a large section of the environmental movement. It thus gave EDF room to compromise on the larger issue, as well on issues specifically for consideration within the partnership (e.g., reusable service ware for in-store customers). For McDonald’s part, capitulating on the recycling issue meant that it would not rupture the relationship with EDF. Thus it could continue to borrow its surrogate claim to legitimacy. The point here, however, is not to say whether the McDonald’s-EDF partnership succeeded or failed. That story can be (and has been) told from friendly and critical perspectives. Here I wish rather to demonstrate the complex way in which the partnership played itself out. What I have analyzed here is the intertextuality of McDonald’s and EDF’s two stories, and of those created by and with other players jostling for control in the discursive struggle around the environment as it played out in the late 1980s through the 1990s. We have seen that neither party freely, unequivocally, and unambivalently moved into the new story of market based environmentalism in the way that much of green business literature suggests. These new alliances have moments of conflict. Indeed, the kind of market environmentalism they enact appears to be integrally tied to the old paradigm of command-and-control, with its panoply of strategies including regulatory control, litigation, and other “heavy artillery” (Krupp, Press Conference, August 1, 1990). Tensions between goals and interests keep the old story embedded in the new, where it serves needs for particular identity constructions at different moments and for particular constituents. In the story of green alliances, for instance, the prince must stay in some ways a frog because a transformative kiss from business would be the kiss of death for the environmental group and, indeed, for the legitimating aspect of the green partnership for business itself. Similarly, McDonald’s cannot turn its golden arches green. I contrast this position with the opposite view expressed in green business literature that suggests a simple and unproblematic evolution from resistance (the old paradigm) to collaboration, win-win rhetoric and voluntarist solutions (the new paradigm), an approach that has been challenged from several quarters (e.g., Dowie, 1995; Levy, 1997; Newton & Harte, 1997; “Perspectives,” 1994; Walley & Whitehead, 1994). What I argue for here is a more complex understanding of green alliances that presents a picture of the dynamics of discursive struggle around the environment in which partnerships play a salient role. Future research needs to examine more recent alliances between business and environmental groups. This task requires contemporaneous research to capture the language of partnership, a difficult prospect. Not only are there considerations of time, but access is especially difficult to attain since the parties are inclined to protect these new forms of collaboration from the scrutiny of outsiders. Indeed, Krupp has explicitly said (1995) that EDF’s early experience had taught that partners should not talk to the press “or others” (p. 10). (5) How these partnerships contribute to, or strain, identity building within the partnering organizations. All of these issues would better illuminate the delicate process of constructing green alliances and provide valuable lessons for those who attempt in the future to build such partnerships and for the researchers who attempt to understand them. 2. The author recognizes that “command-and-control” legislation can be perceived as having beneficial effects in some business situations (e.g., protecting market leaders) and that not all market mechanisms are welcomed by business, particularly if they can be perceived as “sin taxes.” The author thanks David Levy and Jan Beyea for these insights. 3. The Conference Board is a global business membership organization founded in 1916 whose purpose is to “improve the business enterprise system and to enhance the contribution of business to society.” It provides forums and a research program on “key areas of changing management concern, opportunity and action” (Grube, 1995, p. 2). An earlier version of this paper was presented at the Academy of Management annual conference in San Diego, August 1998. The author thanks the representatives of McDonald’s and EDF, research assistant Jennifer Kerr, and the following reviewers for their constructive criticism of earlier drafts of this paper: Jan Beyea, George Cheney, Richard Denison, Julie Graham, David Levy, Ellen O’Connor, Robert Sable, Helen Smith, the Editor, Associate Editor, and the three anonymous reviewers. Aldrich, J. E. (1979). Organizations and environments. Englewood Cliffs, NJ: Prentice Hall. Anderson, A. (1997). Media, culture and the environment. New Brunswick, NJ: Rutgers University Press. Barrett, F. J., Thomas, G. F., & Hocevar, S. P. (1995, September). The central role of discourse in large-scale change: A social construction perspective. Journal of Applied Behavioral Science, 31(3), 352-372. Bormann, E. G. (1983). Symbolic convergence: Organizational communication and culture. In L. L. Putnam & M. E. Pacanowsky (Eds. ), Communication and organizations: An interpretive approach (pp. 99-122). Beverly Hills, CA: Sage. Bullis, C. (1997, October). Business communication and the natural environment: Using traditional and contemporary perspectives to understand the connections. The Journal of Business Communication, 34(4), 455-477. Cantrill, J. G., & Oravec, C. L. (Eds.). (1996). The symbolic earth: Discourse of our creation of the environment. Lexington: The University Press of Kentucky. Carlson, R. (1962). Silent spring. Boston: Houghton Mifflin. Cheney, G. (1992). The corporate person (re)presents itself. In E. L. Toth & R. L. Heath (Eds. ), Rhetorical and critical approaches to public relations (pp. 165-185). Hillsdale, NJ: Laurence Erlbaum Associates, Publishers. Cheney, G, & Christensen, L. T. (in press). Identity at issue: Linkages between “internal” and “external” organizational communication. In F. M. Jablin & L. L. Putnam (Eds. ), New handbook of organizational communication. Beverly Hills, CA: Sage.